Are labour unions a universal good? You bet they are. Just ask the members of CUPE 4764, a tiny local of six determined members in Halifax, Nova Scotia. On August 31, 2018, the local achieved a historic collective agreement with their employer. The local, made up mostly of women, won wage increases that amount to a whopping 27 per cent over their current wages. This increase puts the caseworkers, employed by the non-profit Community Justice Society, on par with many probation officers who are employed by the NS Department of Justice. The local, which had never been on strike before, bravely made the decision to walk away from the work they love, because they realized major changes were needed in their contract and they would only be realized by taking strike action. Strike action began July 30, 2018 and lasted five weeks. Preparing for this round of bargaining was fraught with difficulty. An important part of that work was the job evaluation analysis by CUPE, which demonstrated that the relative value of the work done by these caseworkers is equivalent to 90 per cent of the value of the work done by probation officers in the province. When presented with the report, the employer recognized that there was a wage issue and that the report findings were compelling. Another significant hurdle in these negotiations was the way in which the Department of Justice originally set up the restorative justice program through several non-profits province-wide. This allowed the provincial government to deny their involvement in bargaining by claiming not to be a party to the collective agreement, even though the department provides 100 per cent of funding to the program. A chicken-and-egg situation ensued whereby the province controlled all of the funding and the employer had no ability to increase wages. At an impasse, CUPE 4764 went public with the unfair wages and unfair funding practices and called out the Minister of Justice for failing to take responsibility in these matters. With support from CUPE National, CUPE 4764 ran radio and print ads, as well as letters to the editor to garner public support in the lead up to the strike. They also tapped into their extensive network of allies in the restorative justice community for testimonials and support, including former clients, the NDP, youth court lawyers, and volunteer facilitators. 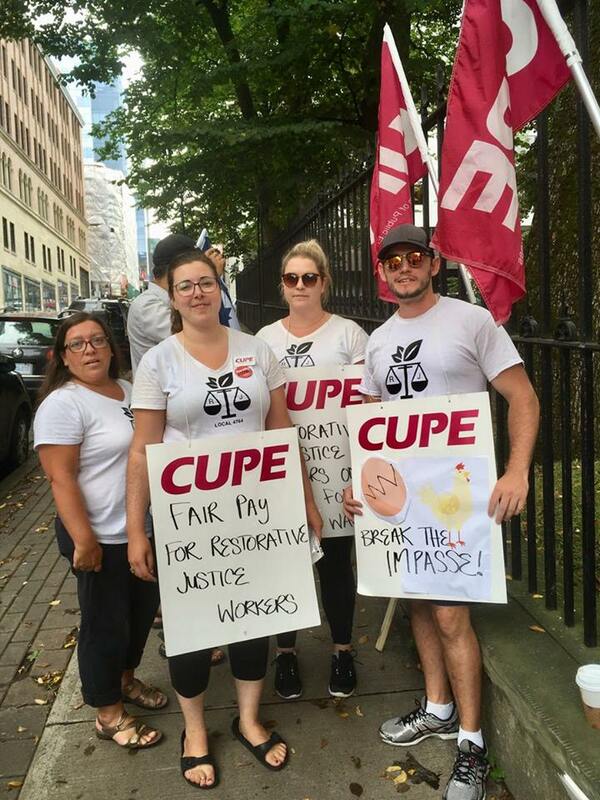 During the strike, they held a news conference and picketed in front of the workplace, the NS Legislature, the provincial courthouse, and the Minister of Justice’s riding office. These events received a great deal of media attention. Restorative justice workers across the province also benefited from CUPE 4764’s victory. On the day they reached their new collective agreement, non-unionized caseworkers employed by other non-profits were informed that they would also receive the same wage increases.